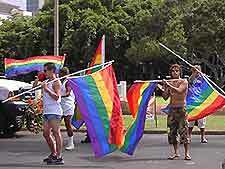 The Kuhio District in the Waikiki area of Honolulu has become known for being home to a number of lively LGBT venues, which include gay and lesbian bars, clubs, restaurants and discos, as well as welcoming hotels and lodging. 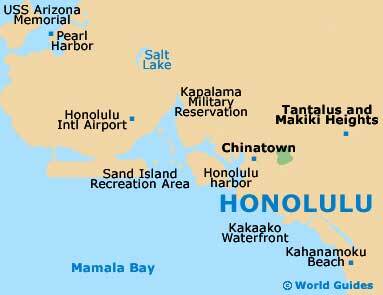 Waikiki is certainly the area where gay visitors tend to base themselves when vacationing in Honolulu, taking full advantage of the beautiful beaches and enticing nightlife. Of note, bars and clubs in Waikiki are particularly concentrated along roads such as Kapahulu Avenue, Kapiolani Boulevard, Koa Avenue, Kuhio Avenue, Lauula Street, Lewers Street, North Hotel Street and Seaside Avenue. Many of these bars tend to be sited within walking distance of both the main beachfront and each other. Always popular with the local gay crowd in Honolulu is Bacchus Waikiki on Lewers Street, which opened in 2001 and sits just off Kuhio Avenue, across from the Courtyard by Marriott Waikiki Beach Hotel. Located on North Hotel Street and within the lively Chinatown district is Bar 35 Hawaii, where happy hours, patio bars, an intimate dance floor, drag acts and tasty fusion pizzas all reliably draw the punters. For stunning views of Queen's Surf Beach while you drink, head to Hula's Bar and Lei Stand on the second floor of the Waikiki Grand Hotel, on Kapahulu Avenue. Hula's Beach offers plentiful live music, themed retro nights, Open-Mic Night Mondays, Tequila Tuesdays, an annual Oktoberfest beer extravaganza and a fun fancy dress 'Hulaween' party. And each Saturday, Hula organizes an LGBT cruise aboard a large catamaran, with tickets selling out fast and usually needing to be booked at least a week ahead. 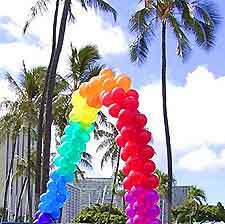 It is advisable to book hotel accommodation well in advance when staying in this sizeable Hawaiian city, especially during Honolulu's Gay Pride Parade in the early part of June, which is held at the Waikiki Beach resort. Pride-goers can expect headline acts, live music and a colorful procession with extravagant costumes. 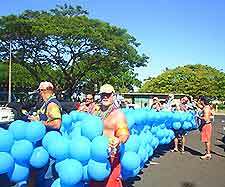 In past years, the McCoy Pavilion at the Ala Moana Beach Park has played a central part in the pride proceedings, with more than 4,000 people attending the Honolulu Pride celebrations. The week before, the Honolulu Rainbow Film Festival serves as something of a precursor to the Gay Pride Parade and is organised by the Honolulu Museum of Art, at the Doris Duke Theater on Kinau Street, being first held way back in the late 1980s.